Guests aboard the World Dream and Genting Dream ships from Dream Cruises can now enjoy Saltability’s signature Himalayan salt stone massage treatments during their cruise. The Genting Dream and The World Dream from Dream Cruises now offer Saltability Himalayan salt stone massage. The ships, which sail around Asia, boast 18 decks and 3376 double bed capacity. The sea is a powerful source of healing and wellness. We are excited that through our partnership with Dream Cruises, guests aboard the cruise liners can enhance their experience at sea with a Himalayan salt stone massage. For the first time, the relaxation and wellness benefits of Himalayan salt stone massage are available at sea. Guests aboard the state of the art World Dream and Genting Dream ships from Dream Cruises can enjoy Saltability’s signature Himalayan salt stone massage treatments during their cruise. The Genting Dream and The World Dream, each boasting 18 decks and 3376 double bed capacity, first set sail out of Hong Kong in 2016 and 2017 respectively, offering their guests a comprehensive wellness experience at Crystal Life, the largest Asian reflexology spa at sea. Health and wellness is a growing reason for people to travel in Asia, according to Thatcher Brown, president of Genting’s Dream Cruises. Citing a recent industry report, he points out that, beyond accommodation, 33 percent of guests place importance on fitness facilities, while 28 percent mention spa facilities. Delivering more health benefits in comparison to a traditional hot stone massage, Crystal Life’s Himalayan Salt Stone Massage offers a therapeutic treatment for guests using Saltability’s organic salt stones, responsibly mined from the Himalayan Mountains. The spa industry’s leading, global provider of warmers for Himalayan salt stone massage, Saltability has twice been honored by the International Spa Association Innovate Awards for its eco-friendly products and dedication to innovation. With 84 naturally occurring minerals and elements, Saltability’s pure Himalayan salt benefits the body by stimulating circulation, detoxifying, improving sleep, reducing inflammation, calming the nervous system, and reducing the signs of aging. In addition to the hands-on benefits of the Himalayan salt stones, Saltability’s specially designed, eco-friendly, LED light salt stone warmer uses very little electricity and no chemicals while emitting negative ions to reduce oxidative stress in the treatment room. 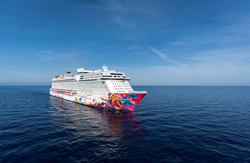 For more information on Dream Cruises and the Genting Dream and the World Dream liner, or to book a cruise, visit http://www.dreamcruiseline.com. For more information on Himalayan salt treatments and products to improve health and wellbeing, visit https://www.saltability.com/. In Asia, Saltability is represented by Spa Advocates, a bespoke spa consulting company which assists with the development of spas and distribution of product brands in Asia and Africa. For more information on Spa Advocates, please visit http://www.spaadvocates.com. Guests aboard the luxury World Dream and Getting Dream ships from Dream Cruises can now enjoy the first Himalayan sea salt treatment available at sea — Saltability's Himalayan salt stone massage.Guests aboard the luxury World Dream and Getting Dream ships from Dream Cruises can now enjoy the first Himalayan sea salt treatment available at sea — Saltability's Himalayan salt stone massage.